The information presented on this page was originally released on February 3, 2005. It may not be outdated, but please search our site for more current information. If you plan to quote or reference this information in a publication, please check with the Extension specialist or author before proceeding. Last year I was giving a program in Oxford and just outside the building on campus was the most beautiful Kousa dogwood in full bloom. I muttered to myself that if everyone could see it, they would know why I put it high on my list. While I am partial to the native dogwood Cornus florida, the Kousa dogwood (Cornus kousa) should be included in many more landscapes. There are almost as many named available varieties of Kousa as the florida. 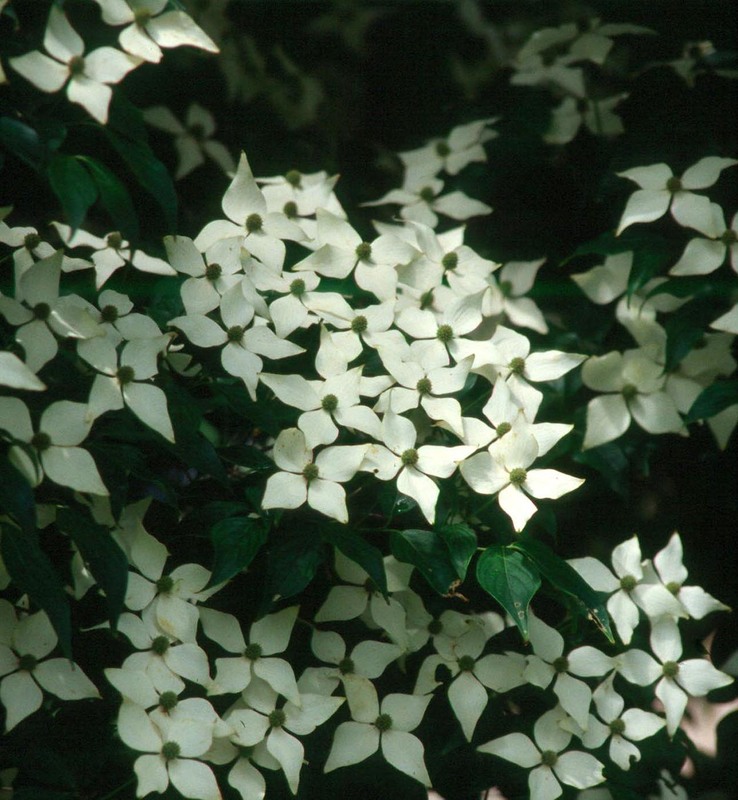 They are not prone to as many diseases, and bloom about three weeks after the native dogwood. Adding some will prolong your dogwood season. The Kousa also blooms with its leaves, which might make you think the bloom will not be as showy. On the contrary, the thousands of star-shaped blooms show out even more against the dark green leaves. It won't be long until our forests and towns like Brookhaven are alive with the shimmering white blooms. Cornus comes from the Latin word meaning "tough wood." Many think they are looking at the flower when they see that brilliant white glistening in the forest. The white is actually a bract, similar to the red part of a poinsettia. The dogwood offers much more than brightly reflective blossoms. The reddish-orange fall leaf color makes it one of the top five tree species in our area. The bright red fruit that goes almost unnoticed by gardeners is devoured by 28 species of birds, including turkey and quail. Whitetail deer and squirrels also find the fruit tasty. While it can be dug from the wild, you will be much better off buying containerized, nursery-grown trees, which are in abundance right now. Whether you choose the native or the Kousa -- which, by the way, is from Japan, Korea and China -- place yours in a well-drained bed. Combine them with azaleas. In fact, it really makes sense to prepare that bed for new azaleas and include a dogwood. Dogwoods cannot tolerate wet feet. It seems almost cruel to see gardeners simply stick a new dogwood in the middle of a full-sun yard with tight clay and encroaching turf. This most likely will result in a negative opinion of a great tree. One surprising thing is the number of varieties on the market. One of my favorite books lists more than 90 varieties of Cornus florida, or the eastern flowering dogwood. Although you won't see all 90 for sale at your favorite garden center, you may find selections of pink and red dogwoods that are highly underused in our area, in addition to named white varieties. Cherokee Brave, Cherokee Chief and Cherokee Sunset are just a few of these. Pink Autumn, Pink Flame and Pink Sachet are other well-known selections of pink-flowered dogwoods, and there are dozens of others. But it is a rare road I travel when I see them blooming in Mississippi landscapes. 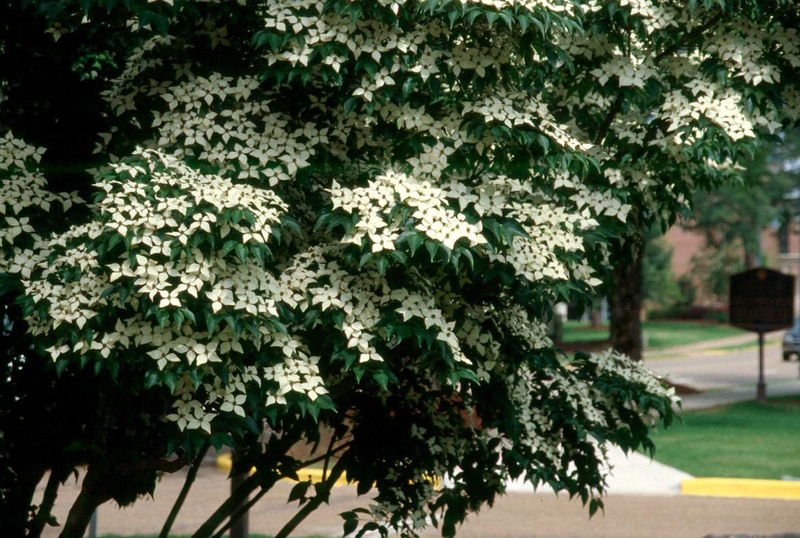 As I mentioned above, the Kousa dogwood has almost as many named selections, as well as some hybrids called the Stellar series. You'll find varieties with names like Stardust, Constellation, Celestial, Aurora and Stellar Pink. Garden centers are stocking up on trees of all sorts and, to be honest, I don't know how many of them have added this prized tree to their inventory. My advice is to keep your eyes open.